Wales will play a friendly match against France in Paris on Friday, 10 November. The game will be played at Stade de France and will kick off at 20:00 GMT. Wales had hoped to be involved in the 2018 World Cup play-offs but have organised the Paris match after missing by losing 1-0 to Republic of Ireland in their final group game. 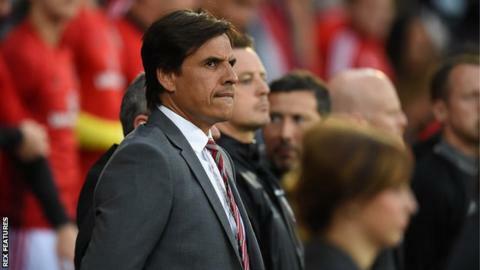 Chris Coleman, 47, will be in charge as manager, although he is still considering his future. The manager's contract expires at the end of November and the Football Association of Wales hopes to begin talks with him in the next couple of weeks. Wales will possibly play a second friendly in November. It will be the first time the countries have met since Wales won 1-0 in Toulouse in 1982 thanks to an Ian Rush goal. France are ranked seventh in the world and are among the favourites for the World Cup in Russia, having won the crown in 1998. Manager Didier Deschamps' side boasts a cluster of world stars, including Manchester United's Paul Pogba, Antoine Griezmann of Atletico Madrid and Paris St-Germain teenager Kylian Mbappe. France were Wales' first friendly opponents from outside the British Isles, when they played a game in Paris in 1933. Wales have also been invited to take part in the China Cup in March 2018. The four-team competition was held for the first time in January 2017 and featured Chile, Croatia and Iceland as well as hosts China.